Above you can see a pretty little South African farthing from 1931. Well, actually you can't see it, what you can see is a brown coin behind some very scratched plastic. Scratched or scuffed slabs are a typical problem, especially with older slabs or those that have not been cared for properly. One of the huge advantages of slabs is that this damage is done to the plastic that encases the coin rather than the coin itself. One of the dis-advantages with scratched slabs is that taking images of the coins within is problematic at best, and as seen above the coin is largely obscured. We'd read about other coin collectors having using normal car cut and polish compound on both PCGS and NGC slabs given that the technique used to polish the plastic is correct. So, to test this out for ourselves we went down to our local car parts shop and bought some Polyglaze Cut and Polish. We applied small amounts of polish to a soft cloth and worked it onto the surface of the above slab. We made sure to polish up and down rather than from side to side or in circles. The reasoning behind this was that we light all our coins from the top when imaging and we tried to align our polishing lines in the same direction. This would ensure that the lines would not show up in the images due to light reflections. Each side was polished for several minutes until (to our eyes at least) the worst of the slab scratches were removed. You can see the results below. We're sure that you'll agree that the results are pretty impressive. So, don't go out and drop a lot of cash on expensive specialised slab polish, just head down to your local car parts shop and get what you need to remove the scratches and scuffs from your slabbed coins! If you can attend an auction viewing then do so. View all lots you are interested in. Often it is worth viewing your lots twice, the second time round often reveals things that the first look did not. Take your loupe, make sure the light is good, make sure you eat and drink properly. You will likely be sitting still for a long time and need to maintain your concentration. If you can't attend the viewing then get someone you know and trust to view the lots you are interested in for you. If you can't attend the viewing and can't get someone to look at lots for you then make sure the auction house has a strong return policy. You will want to return a problem coin if you end up winning it. Try to stick to buying reputable third party graded and slabbed coins if you can't attend the auction viewing. Sure they may have problems too but at least you will have a definite idea of what the coin is likely to be like given the numeric grade. There's been a couple of poor taste remarks in some well known dealers' mail order catalogues recently directed at PCGS graded coins. Given that PCGS graded coins are becoming more and more common place in the market these days (a quick eBay search shows more than 200 slabbed Australian coins available right now) you'd think that these dealers would be trying their best to learn and move along with what the market is saying. But no, they have to stick their heads in the sand and try to dictate to the market what it is that collectors want. In my experience this is a well known short cut to a drop in sales and a quick exit from whatever industry you happen to be in. Here's a gem of a comment from a well known dealer in their latest mail out offering. ...which has been slabbed and graded by P.C.G.S. as VERY FINE - IT IS NOT VERY FINE! This coin I wold grade FINE+ which is two grades below P.C.G.S. The moral to the story is, when buying or trading any third party graded coins or banknotes, make sure they are correctly graded and priced accordingly. Well there's a couple of points that this 'expert' has clearly missed. 1. PCGS probably have graded the coin correctly as VF30 according to the Sheldon scale that they use. Nowhere do they say that it is graded as Very Fine according to any adjectival grading scale, nor do they say it is graded according to ANDA standards. They have graded it according to the standards they've made available quite publically here: PCGS Grading Standards. What standards does the dealer who publishes this catalogue grade to? Well your guess is as good as mine because it doesn't say in their catalogue. 2. Ignorance is only brought into sharp relief when displayed from a position of self assumed expertise. The advice to make sure that slabbed coins are graded correctly is good but the key point has been missed. PCGS DO NOT GRADE TO AUSTRALIAN STANDARDS. Do Australian dealers hang their heads in shame when English dealers grade Australian UNC coins as EF or gEF? I think not, a lot of English dealers use different and much tougher standards to grade coins than here in Australia. I can only hope that dealers like this one either learn to move with the times or are pushed to one side as the market moves forward. Reputable third party grading is better for the industry, PCGS have no hidden agenda with regards to the Australian coin industry and they probably provide as close to an unbiased grading service for Australian coins as can be had anywhere. I may be an un-trusting soul, but whose grading would I trust first? A dealer that I don't know at all who has to make a profit and whose gradings might be coloured by this motivation or a company who really doesn't care if a coin is graded VF30 or F15 as long as the grading complies with their own standards. I'll let you decide. In late May this year PCGS filed a US Federal civil suit against a group of 6 individuals they call 'coin doctors'. I'll write about the suit in a subsequent entry because it should be of interest to any serious coin collector. However, in this entry I thought it would be worth having a look at what coin doctoring actually is, mainly because it's not a term you encounter very often in Australia. In US coin collecting circles it is sadly well known and is beginning to be a real threat to the industry. One very well known US coin expert and dealer has estimated that up to 15% of the PCGS and NGC slabbed pre 1938 coins that pass through his hands have been 'doctored'. Yes, you read that right, these doctored coins have been slabbed by PCGS and NGC. Not deliberately, but because the 'coin doctors' are so skilled at their art that they manage to slip the coins past the graders at these TPG's and get them encapsulated. PCGS go on to describe specific coin doctoring methods used on several coins they've seized that include lasering of coin surfaces and rebuilding of design features using putty or jewelers metal. To give you an idea of how sophisticated these methods are, a big dealer in the USA who knows the six named 'coin doctors' estimates that there are 20 or fewer people in the entire USA who could use the coin doctoring methods PCGS describes in their civil suit. So, that's coin doctoring. These 'doctors' do it to get a coin into a PCGS or NGC slab, make a quick and obscene profit and move onto the next project. Of course the collector who buys such a coin is left with a dud as the doctoring methods become apparent years down the track as the coin deteriorates and then PCGS or NGC are left to pay for the coin under their guarantee programs. These programs offered by PCGS and NGC will actually buy back a coin at full market value if it is found to be slabbed as a counterfeit or doctored. So you can certainly see the reasons why PCGS is out to get these coin doctors! In the next week or so I'll post a follow up to this article taking a look at the suit that PCGS has filed against the coin doctors. If you collect coins then the refrain 'learn to grade coins' probably goes around your head like a broken record. If you're going to submit coins to PCGS or some other third party coin grading companies don't go thinking that this negates the need for you to grade your own coins. As far as I am concerned it makes it doubly important. We've just posted up an article over at The Purple Penny on the importance of grading coins for yourself. Please go over there and take a look, I'd like to think it's well worth a read! We were lucky enough to receive some comments from a reader of the blog who has some experience as a copper artist and also happens to be a coin collector. His comments were in response to the recent post about PCGS and Perth Minted Australian Copper. His comments can be found below. Hi, Regarding the October 09 article on PCGS gradings and rainbow copper coins. While my following comments should not be in any way taken as an accusation I think the reason that PCGS is not inclined to accept such rainbow coins as "genuine" is this "Rainbow Effect" can be brought about with fresh copper by the simple use of a Blow Torch. I know this because I use to do Copper Art at one time as a hobby. There is also a chemical that can be purchased that is sold in Craft Shops that will also give "rainbow" effects to fresh copper. Personally as a Coin Collector and ex copper art artist I am always very wary of any "Rainbow Copper Coins". That is not to say they don't come about this way purely by natural means. However, I can well understand PCGS being nervous to put their name to such coins. Great photography and very intersting article. Thanks for your input regarding this, we strive to post accurate information from reputable sources. Would you mind if we post your comments (anonymously of course) as a potential cause of this effect? In the USA artificial toning is common practice so I realise it must be difficult. 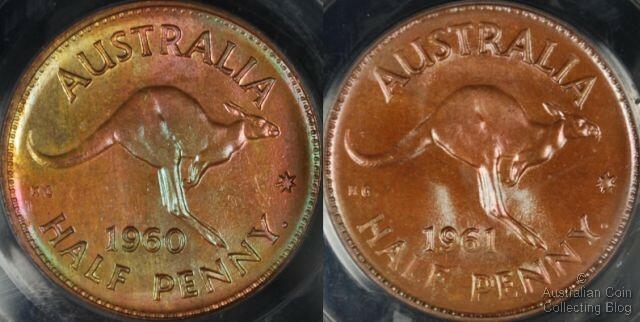 The whole idea of the article is that it is well known by Aussie numismatists that Perth copper does come in spectacular colours and PCGS should be aware of this. Like you say there are natural processes where copper will go those rainbow colours by its own accord. However, it is more rare than common as the pennies/half/pennies are not completely copper as you realise they are a form of bronze with two additional metals. It becomes much more difficult for bronze to reach that colour level. The more pure the copper the easier the colour. Annealed will show those colours in areas when heated. If you ever watch a Gas Fitter at work you'll see the copper tubes go multi-colour while using brazing torch etc. Too much heat and the copper will go almost dark/brown/purplish. It is an interesting subject and as I said originally there is no intention on my behalf to say it doesn't happen naturally with Perth Mint Copper Coins. Just suggesting a reason why PCGS might be reluctant to accept same. So here we have some reasons why PCGS might reject rainbow toned coins, and given the huge premiums rainbow toned US copper coins can garner I can understand this caution. Of course this doesn't apply to most Australian copper, rainbow toned copper are usually later common date coins and of low catalogue value. Also, while Australian rainbow toned coins can command a small premium over their more plain brethren it is never very much, a few tens of dollars at most, and one wonders if it is worth 'doctoring' a coin for such a small benefit. There's some other things to take into account too. Firstly, rainbow toned Perth copper isn't common, it is much easier to find reddish or brown Perth copper and very nicely rainbow toned coins are quite scarce. Secondly, rainbow toned Melbourne minted copper is almost non existent in comparison to Perth minted material. If someone was out there doctoring coins why are they only doing it to Perth minted material and not those coins minted in Melbourne? The answer of course is that in almost every case the toning is natural and a result of the different ways planchets were prepared in the two mints and the way the coins were struck! For example, why are Perth minted coins so often found with spotting and Melbourne coins not? The Perth mint washed their planchets (before or after striking I am not sure) and the Melbourne mint did not! Secondly, Melbourne minted copper coins of the 1950's and 1960's are, on the whole, much more strongly struck than Perth coins, and it is my experience that the most eye popping rainbow toned coins are also the worst struck coins the Perth mint released! Now none of this is intended to dis-credit the kind reader of this blog whose comments are found above. After all if you read his responses you'll see that he's not suggesting that rainbow toned Perth copper is artificially toned, but rather why PCGS might think it is artificially toned. My responses to his post have just pointed out to PCGS why rainbow toned Perth copper coins are almost always naturally toned. They are not fiddled with or manipulated like their American brethren can be. Here's hoping someone out there can educate them and we can get these lovely coins protected and graded by a good third party grading company! Above you can see two lovely rainbow Perth copper coins that were submitted to PCGS for grading. My apologies for the quality of the image of the half penny, I didn't get a chance to image the coin before it was sent away and getting the rainbow toning to show up through the coin slab is problematic at best. Both of the coins show very typical Perth rainbow toning that is so valued by some collectors. Colours appearing are very typical, brown, gold, blue green, reds, and even hints of violet. The coin on the left was broken from an original bank roll immediately before being sent to PCGS, the one on the right came out of a push in coin album where it had sat for a number of years. 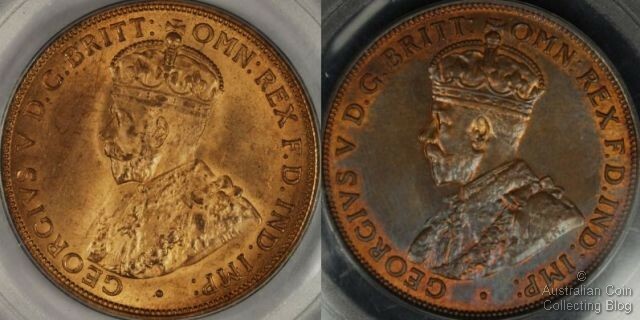 Sadly, the penny on the left came back graded as "Genuine" with the code 91, which means 'Questionable Colour'. The one on the right came back as MS65RB. I'd like to say definitively why PCGS rejected the coin on the left and accepted the one on the right, but I simply cannot. A month after the penny was rejected I am still scratching my head as to why. It is a lovely coin with glossy surfaces, well struck for a Perth coin, and exhibits attractive rainbow toning. The half penny fits the same description exactly. And because of this I sent the half penny to be graded immediately after the penny to see if it too was rejected. Inexplicably it wasn't! The only theory I have is that one or more graders at PCGS simply do not have enough experience with Australian coins, and Perth minted copper coins in particular. These rainbow toned coins are completely original and un-tampered with and deserve to be graded as the GEM coins that some of them are. There's probably not a lot we can do in the short term to educate PCGS. However there are dealers in Australia that submit many dozens of coins to PCGS and I am sure that with emails or phone calls to the right people at PCGS would result in PCGS being educated appropriately. The warning for Australian collectors who are thinking of submitting rainbow toned Perth minted copper coins to PCGS is be aware that despite the beauty and originality of your coins, there is some chance that they may be deemed as having 'Questionable Colour' and will not receive a grade. It's times like these that a possible submission of these coins to NGC is in order, NGC has more world coin slabbing experience than PCGS and will most likely slab them with a grade rather than as artificially toned. If you're into collecting PCGS graded coins at all then you're almost certainly aware that PCGS (and the other major third party grading companies) grade mint state copper coins with a colour code. These colour codes (RD for red, RB for red brown, and BN for brown) try to describe the colour of a coin, but a coin is far too complex a beast to be able to be described with a simple two letter code. So, lets take a look at a few coins. One of the coins above has been designated as RB (red brown) and the other as RD (red). Which is which? Is the coin on the left a RD or RB coin? What about the one on the right, RB or BN (brown)? What does RB really mean anyway? 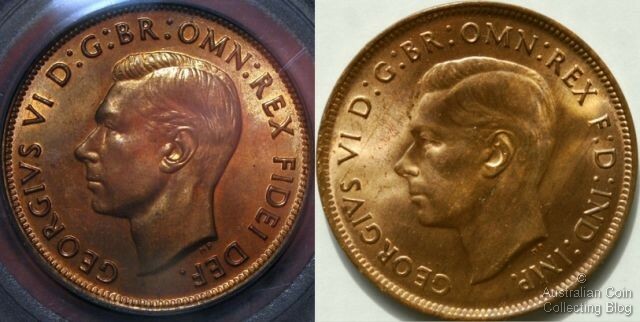 The coin on the left is an attractive rainbow half penny oozing eye appeal, the one on the right an even brown coin. Both are designated as RB and one is graded 1 point higher than the other. Which is the higher grade and which is more desirable? I've answered all these questions (and several more) over on the Purple Penny website, in the new article PCGS Graded Australian Copper Coins and Colour Codes. It is well worth the read for anyone interested in collecting or buying slabbed Australian copper coins. We've just written a pretty comprehensive article on what it means to have a coin graded by PCGS, how it is certified, and how PCGS records and tabulates the data about coins it has graded. It's available over on the the Purple Penny website and is titled Understanding PCGS slabbing, certification and the Population Report. Please take the time to head over and give it a read! I've just been going through the process of making my first submission of coins for slabbing to PCGS (The Professional Coin Grading Service). If you are not sure what this means it might be worth taking a look a the short series of posts I made about Third Party Grading Companies. Because I am based in Australia, and the process of submitting coins seems to be, well, rather bureaucratic this hasn't actually been the easiest thing to do. Firstly, to submit coins to PCGS you must either join their member program or use a PCGS Authorized dealer to submit the coins for you. I chose to submit the coins myself because there's no authorized dealer in the city I live in. The dealer I have used in the past to submit coins for me had decided to stop submitting coins for the time being because of the poor Australian / US Dollar exchange rate. So, I decided to join up with PCGSs 'collectors club' and submit some coins myself. The Collectors Club includes three levels of membership. Each level gives you a number of free submissions each year as well as access to different features of the PCGS website, including the population report and PCGS price guide. Membership lasts for one year and includes a free quarterly grading specials (usually a US coin of some sort). PCGS were offering discounted memberships in late 2008 so I decided to join up with Platinum membership which entitled me to 8 free 'regular' coin grading submissions. A 'regular' submission allows you to submit any coin worth less than US$3,000 as long as it is not a mint error or special issue. Free submissions sound great, but there is still a handling charge for the free submissions ($8 or so per order) and you still have to pay for insured shipping to and from PCGS. This is not too bad in North America, but down here in Australia you are looking at at least US$50 for just return shipping which is about AUD$75 at time of writing. So free isn't quite free, but still, regular submissions are worth US$30 each and the discounted joining fee was $180, so it was pretty good value. Upon joining PCGS send out a new members pack containing all that you should need to make your first submission and new member information. This pack only took a couple of weeks to arrive here in Australia, which considering it was the Christmas / New Year period was pretty darn good. The pack contained the free submission voucher, detailed coin submission instructions, 8 2.5" mylar flips and adhesive labels, 3 submission forms, and the catalog of their coin numbering system. You can see the contents of the pack in the image at the start of this post. The 'US Centric' nature of PCGS really shone out with the member pack. The submission forms were all US Coin submission forms, and the catalog of their coin numbering system was for US coins only. So essentially these two items were useless to me because I wont be submitting many, if any, US coins to PCGS. PCGS should really allow new members to select if they will be submitting world or US coins at time of joining and the new member packs should be tailored accordingly. There's more coins in the world than simply US coins, and the number of world coins submitted to PCGS will only grow, and they should be preparing for this now, not later! In the next part of this series I'll cover the submission process, including packaging the coins and filling out the forms. In later parts I'll cover the coins I'll submit and have a go at grading them so I can compare these grades with the grades returned from PCGS. Expected turn-around time for the coins is 40-60 days so I'll have plenty of time to think about it!